Equities, Options and Futures Accounts: TradeStation and RadarScreen® free for 6 months is defined as no account service or RadarScreen fee for the first 180 days following account opening; valid for clients who open and fund a brokerage account by 4/30/11. TradeStation FREE does not apply to charges associated with commission fees for trades executed through the TradeStation platform, exchange fees, regulatory fees, or other account fees and charges, including margin interest, if any. This offer cannot be combined with any other offers. Additional restrictions apply. Terms and conditions are subject to change at any time. Login and save time completing your new account application. 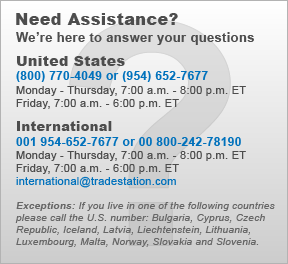 Check the background of TradeStation Securities, Inc. and its registered representatives on FINRA's BrokerCheck. No offer or solicitation to buy or sell securities, securities derivative or futures products of any kind, or any type of trading or investment advice, recommendation or strategy, is made, given or in any manner endorsed by TradeStation or any TradeStation affiliate and the information made available on this website is not an offer or solicitation of any kind in any jurisdiction where any TradeStation affiliate is not authorized to do business, including but not limited to Japan. Copyright © 2001- TradeStation Group, Inc.